Alaa Mukahhal is almost done telling me about her upcoming court date. It may end in her deportation. A moment of silence is followed by a huge sigh that expels from Alaaâ€™s lips. My palms sweat as I grip the phone tightly, not knowing what to say. But before I can utter a word of comfort, I hear an unexpected noise: laughter. As I hang up the phone, I turn to my computer, wondering how being undocumented could ever be funny. After interviewing Alaa and more than a dozen undocumented immigrants for an undergraduate research project last year, I found myself feeling a spectrum of emotions, but mirth wasnâ€™t one of them. During the process of finding undocumented activists to interview for my research project, Angy Rivera, the first and only undocumented columnistÂ in the nation, was someone I wanted to interview but couldnâ€™t get in touch with. 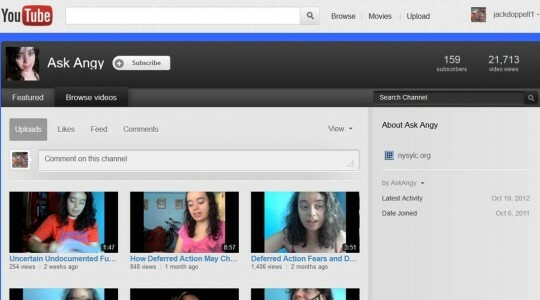 Instead here I was, clicking through her YouTube channel while talking to her close friend Alaa. Of all of Angyâ€™s YouTube videos, I was most attracted to her â€œDating while undocumentedâ€ video, not only because Alaa strongly recommended it, but also because I was aÂ single female who just turned 19. In fact, I was willing to pay extra attention in case I would hear some expert advice on how to date guys. Even better. Angy started the â€œDating while undocumentedâ€ video by saying that being undocumented is often a group experience that affects not only you, but those around you. One question after another was followed by a loud buzzer noise and a screen shot of a disapproving Angy. As much as I wanted to laugh and feel some comfort in knowing Iâ€™m not the only one who asks such stupid questions, a memory of my former self haunted me. When the video ended, I found myself lost in thought of my not-so-old past. About five years ago, I immigrated to San Francisco from Seoul, South Korea, with my mother and my stepfather. Throughout the first few days of our stay in a cramped apartment space in Haight-Ashbury, I complained of sharing a room with my parents. I would often wake up to the consistent tap-tap-tap noises my father would make, as he hovered over a laptop that glowed silently in the dark. Almost immediately upon our move-in, my father started looking for a job to feed us all. Every morning, he would head to the city, dressed in his best suit with his favorite watch clasped on his wrist. It was not long before I noticed that these interviews turned into a continuous part of our lives. Four interviews would turn into fifty, and from one interview to the next, I noticed my fatherâ€™s shoulders sag more and more. Once I started school, the constant lingering presence of my father quickly became a mysterious annoyance. I blamed my fatherâ€™s unemployment on his old age or his lack of a college diploma. Little did I know why he was turned down from one job after another. The evolving feminist in me became even more outraged as I saw my mother work long and hard hours, drive to and from her work and my school, and pay our bills with her small salary as a Japanese sushi bar waitress. To me, she seemed like a Korean Atlas who carried our family on her tiny shoulders. One evening after dinner, I saw my mother apply hand salve on her hands while my father switched the channel with a remote. I was shocked at how unrecognizable her hands were from when I last saw them in Korea, but more outraged by the contrast their hands bore. While her hands were crackled with dryness and hardened with callouses from the constant dishwashing, his hands had an almost unapologetic sheen to them that showed no sign of hardship. I stared at my fatherâ€™s unmoving face, waiting for anÂ explanation, an excuse, or even an apology for his laziness. Instead, I saw my 46-year-old father slowly kneel on the ground next to my mother, who scurried to hold him back up. As soon as those words escaped his mouth, I felt the blood rushing through my cheeks. I was oblivious and ignorant of how immigration papers held a strong hold over the lives of those it documented. 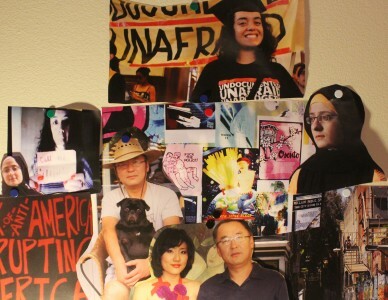 As Angy discussed in her video, undocumented immigrants had to live with the uncomfortable choice of telling their status or keeping it to themselves. My father chose not to tell anyone until that night. My fatherâ€™s confession that evening still haunts me to this day. Later on that evening after watching the video, I emailed Alaa, thanking her for recommending Angyâ€™s YouTube video. Alaa had trusted a stranger with her story, and in the process, sheâ€™d made someone less oblivious and ignorant.